In summary, "A modern looking design with a traditional format but also a twist!". By modern design, I mean the way the photos and text have been put together. There are a number of large photos introducing new chapters with black edges and part of the photo is black and white. There are also panel inserts containing specific information. The format is quite traditional in that there is information about how to grow clematis, a quick history of clematis (titled "Understanding the Genus"), growing and propagating including clematis for different situations, pests and diseases including wilt, growing from seeds and division etc. The main part of the book, describing 196 clematis, is divided into two groups, Large-Flowered Hybrids and everything else. For each of the 196 clematis, Linda has given a description containing information relevant to the plant, as well as the normal info regarding height, light exposure, bloom time, pruning and zones. There is also a section on 'Landscape Uses' containing some interesting comments on growing the plants. Clematis which are listed in the Society's Clematis for Beginners List are also indicated. The 'twist' in the book is brought by the author's style and down to earth approach. Linda tells you about the plants attributes; good and bad. As Denise MacDonald said when we discussed the book, "Our President's personality shines through!" 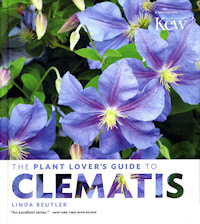 One of my favourite sections is where Linda discusses the problems of growing Clematis armandii (page 58). She doesn't mince her words. I read about the drawbacks of the plant and can hear her voice. Another amusing section is titled "The most challenging clematis you will ever lust after!" (Clematis florida var. florida 'Sieboldiana', page 47). I talked with Denise and Roy Nunn about the photo quality. A number of the clematis look pale, e.g. 'Étoile Violette' (page 171), but overall Roy and I concluded the colours were acceptable. A few other photos appeared out of focus until you realized the small flower in the centre was sharp. We have only identified one as not being the correct flower. Looking at the audience for this book, the general information and plant descriptions will certainly suit a beginner. However, the book has information for the more experienced grower too, especially one who wants a more 'natural' garden. There is interesting discussion on pruning and on the current groups - how they are not very helpful to the gardener or indeed to the plants themselves. Linda suggests how the plant pruning groups might be revised and we will see in the future if her suggestions are accepted.